Who says words need to be concrete? This collection shapes poems in surprising and delightful ways. 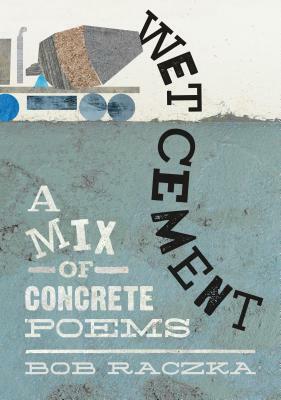 Concrete poetry is a perennially popular poetic form because they are fun to look at. But by using the arrangement of the words on the page to convey the meaning of the poem, concrete or shape poems are also easy to write! From the author of the incredibly inventive Lemonade: And Other Poems Squeezed from a Single Word comes another clever collection that shows kids how to look at words and poetry in a whole new way. Bob lives with his wife, Amy, in Glen Ellyn, Illinois. They have three children (Robert, Carl and Emma) and a dog (Rufus). They are all Cub fans. As a boy Bob loved to draw, especially dinosaurs, cars and airplanes. He also spent a lot of time making paper airplanes and model rockets. One time, he even made a flute out of a stick he found and it actually played music. Bob studied art in college, which came in quite handy while he was writing his series of art appreciation books, Bob Raczka’s Art Adventures. He also studied advertising, a creative field he has worked in for 30 years. A few years ago, Bob discovered how much he enjoyed poetry. It wasn't long before he started writing his own. He has always loved playing with words. If Bob could share just one message with today's kids, it would be, “Make stuff!” Draw imaginary creatures. Build forts. Write comic books. Make up games. Invent a new baseball pitch. Design your own Halloween costume. Try your own recipe. A fantastic short story collection that has a little something for every reader: dystopian societies, faeries, steampunk, shapeshifting aliens, revolutions, sentient ponds, Cajun dragons, and foodie wizards. Full of sci-fi, fantasy, and Afrofuturism - a must read!